Article: Great Leadership: Can a Woman Leader Be Successful and Happy? While I'm on vacation, here's a guest post by John Hersey. I'll bet the title at least got your attention. Many, women and men, believe they can’t. Equally, many have experienced failure while trying, but there is indeed a way for women leaders to be successful and happy. The question is: What makes women happy? A team of researchers spent five years looking for the answer to this question. After this time, they discovered why successful women are as much excellent professionals as excellent in life. They talked to more than one hundred extraordinary women worldwide who have managed to uphold happy families and also leadership careers in every kind of field, from orchestra conducting to espionage, and who state that they are deeply satisfied with the choices they have made. One of the most important characteristics the researchers found is that these women are prominent because they are doing something they see as significant. Some women simply know what makes them happy and chase after it since they are very young, like a Nigerian lawyer who was inspired by a TV show when she was a child and didn’t stop until she was able to establish her own law firm. For others, the road towards the discovery of what makes them happy sets them free to find passion in new ways, like a consultant who dumped a profitable career her parents had chosen for her to follow her dream of making movies. Finding their passion gave these women the strength to turn into individuals that make things happen, instead of waiting for others to decide about their lives. Being able to do this fills you with a kind of energy that moves from work to home and vice versa, making everything right, and rewarding. These women are realistic, they are able to analyze the evidence and act accordingly. Women are very often labeled as emotional extremists, vulnerable to feelings of failure when confronted with problems, but it is possible to turn things around consciously and take care of any issue for what it is. Being emotional is, in fact, a strength of successful women. Women leaders are able to bond with people, and through these deep relationships, they get a feeling of being in the right place. By acknowledging the individuals around them, they are able to boost and speed up their personal growth. The research showed that women who follow these practices are happier and more successful in their jobs, as leaders, and in their lives. 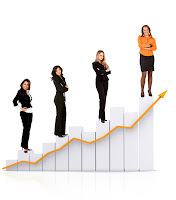 Every company should be aiming to get and keep these women leaders; they are strongly capable of steering leadership performance and action by creating meaning and might, by outlining circumstances to find the best way out, by channeling the force of comprehensiveness and total commitment, and by dynamically directing energy flows. These women are powerful and happy because they assumed control of their lives, and anyone can do the same, regardless of ambiguity, chance, or any stress they may be experiencing. I'm always a bit wary of articles and posts which are gender related, and especially when they're written by someone of the opposite one... However, this is quite interesting to read, especially if you substitute "people" for "women" at appropriate points. For instance, "Every company should be aiming to get and keep these women leaders" is a great sentiment, but surely "Every company should be aiming to get and keep these great leaders" would be better? Or maybe even, "Every company should be aiming to identify, develop and keep these great leaders" - allowing for the home-grown talent to be spotted, and shaped (regardless of gender). After all, leadership, like many other skills, is something that should be ever evolving. Certainly on a personal level, my skills in the various elements that make up leadership, change (hopefully for the better) due to external or internal influences - it could be feedback received, it could be a book I've read, a podcast I've listened to, a practice I've seen someone else using to good effect, some training I've received or a blog post read. None the less, I've just gone off and subscribed to John Hersey's blog as there looks to be some interesting and relevant material there.